Designed to make a big statement in garages, workshops, mudrooms and other areas of your home, the Bold 3.0 Series cabinet system instantly upgrades the look of your space, providing you with organized storage for all your belongings. Built with heavy-duty 24-gauge steel for added strength, these cabinets are ready to hold everything from sports equipment to gardening tools, and the scratch and stain resistant powder-coat paint finish protects the cabinets from everyday heavy use.Full-length integrated handles allow you to quickly and easily access your gear, and adjustable steel shelves give you the flexibility to store items of all sizes, while fully-lockable doors ensure that your tools stay safe.Get organized, and simplify your life, with Bold 3.0 Series Garage Cabinets. Stronger and more versatile than ever before, the Performance Plus 2.0 Series Wall Cabinet has been redesigned with fully welded, 18-gauge steel frames and a reinforced double walled door that lifts-up on pneumatic gas shock hinges; ideal for keeping harmful supplies out of the wrong hands. The Wall Cabinet features integrated stainless steel door handles, an adjustable steel shelf, and an integrated light channel on the underside of your cabinet which allows for hidden LED lighting (LED lighting sold separately). The included wall mounting brackets and hardware make it easy for installation directly on the wall while utilizing your garage space to its full potential. 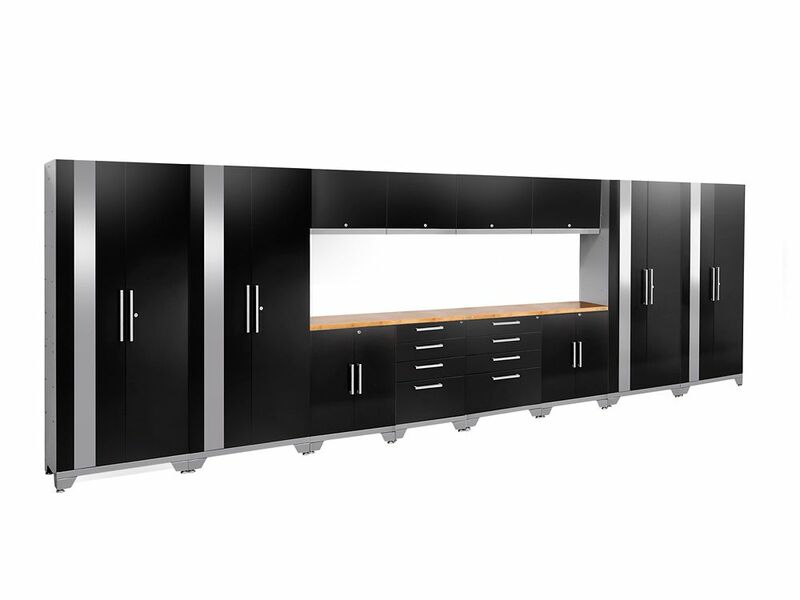 Performance 2.0 Series 14-Piece Garage Cabinet Set in Black Get all those cables, decorations, and gardening tools off your garage floor and into NewAge Products newly redesigned, Performance 2.0 Series modular garage cabinetry. These cabinets are built to last with their fully welded, 24-gauge steel frames and fully lockable, double walled doors. Our configured sets are shipped with adjustable steel shelving; easy-to-grab stainless steel handles and height adjustable levelling legs that accommodate uneven garage flooring. The manufacturers limited lifetime warranty gives you the insurance that your cabinets will look great for years.